We don’t have an intracoastal waterway on gulf coast of Florida. We do have back bay and cruising water ways but they’re not continuous. In south Lee County in the Bonita Springs and Estero areas there are a few channels that open to the back bay from the Gulf of Mexico - New Pass, Hickory Pass, Big Carlos Pass, Wiggins Pass. 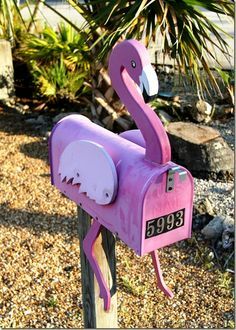 The flamingo mailbox is located just off of Broadway Channel on Hickory Island. I found it last week on my way to take a look at Bay Park North boat ramp at the north end of the island. The homes on the east side of Hickory Island often have gulf access via canals or Broadway Channel and the back bay. They’re within walking distance of Bonita Beach, too. There’s a premium to be paid for real estate that offers gulf access within close proximity to the beach. It’s the fastest access to the open gulf in the area, just minutes away. The supply for real estate on this narrow strip of land is limited and the demand usually remains high. Vacant lots to build on are few. A good portion of home owners purchase older home to rehabilitate or to add onto. The area has older cottages, stilt homes and some of the original fishing cottages from decades ago. The next time you drive down Hickory Boulevard turn onto Melody or Harmony Lane and take the tour or stop by Cypress Land and see the flamingo mailbox. If you’re daredevil take a look at *this*, it was on the mailbox one house over.